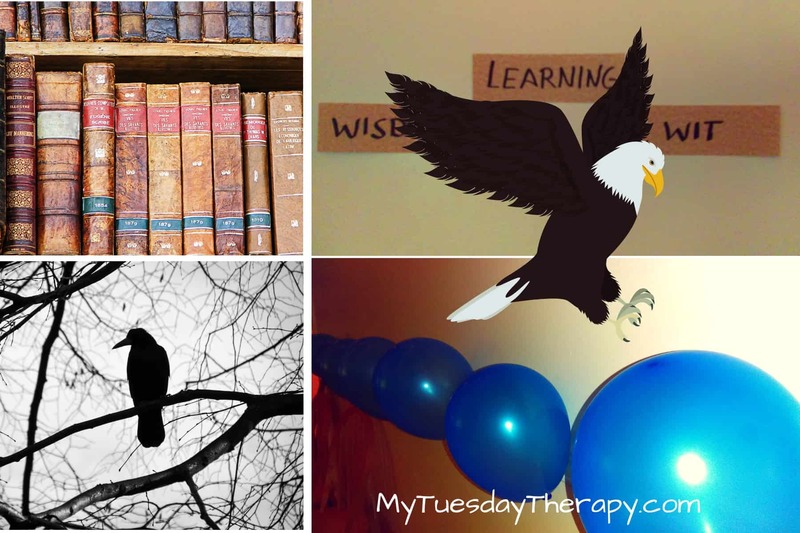 The intriguing tale of Harry Potter – the Boy Who Lived, has inspired many to throw magical Harry Potter parties. Parties in which you get to experience the amazing hospitality of Hogwarts, participate in adventures, and create many everlasting memories. With so many choices for hosting the most amazing Harry Potter party it can get quite overwhelming. You could spend endless hours and a ton of money buying and making decorations, preparing magical food etc. 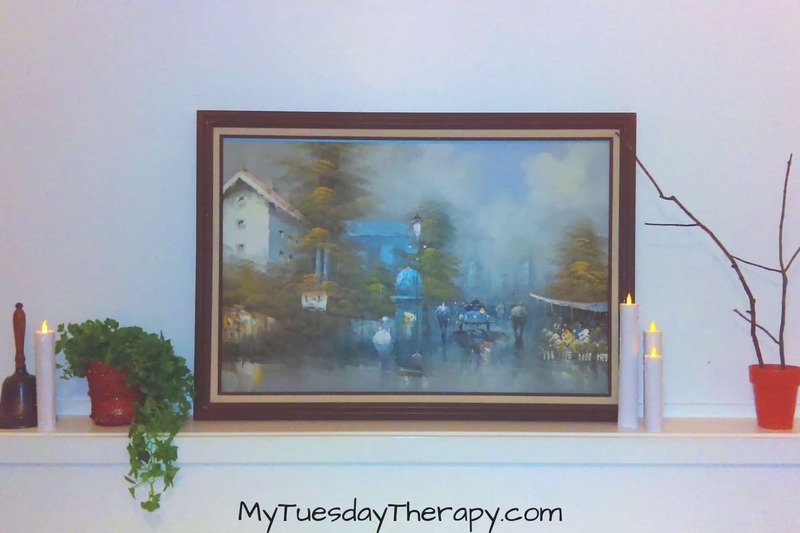 With these ideas you will spend some time putting it all together but it won’t cost you a ton. 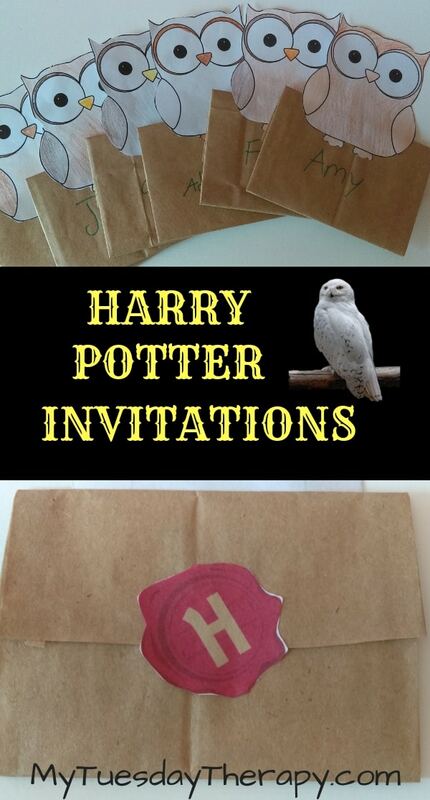 I have awesome Harry Potter party printables in the Freebies. This was the second time I hosted Harry Potter party and this time our theme was 20 years of magic. We didn’t do the potions or charms classes but had a celebration meal at the Great Hall and played games in the Common Rooms. It was a fun way to celebrate the amazing tale of Harry Potter. We made these super cute owl save the date cards. We emailed the invitations. I get these brilliant ideas like hand-delivering the owl mail. So, we drove around close to four hours delivering them. Some of the friends live an hour away in different directions… It was fun and the receivers were delighted. But nothing wrong sending them by mail or simply emailing them. I wish I could somehow make the staircases to change and the paintings to talk but I can’t. 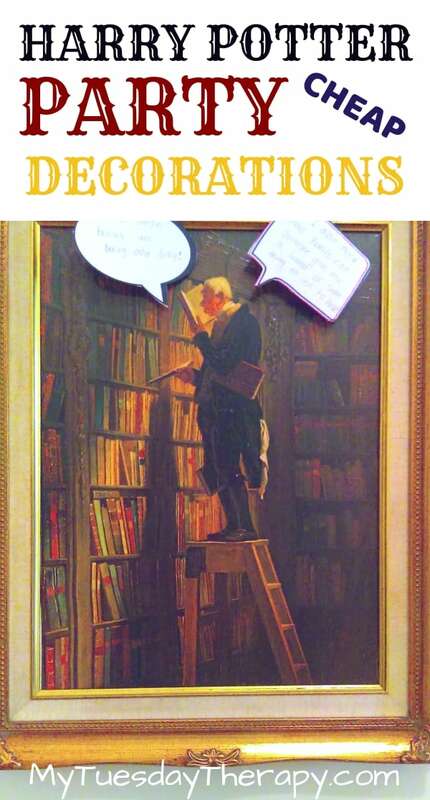 So, we dragged from the storage a few gold framed paintings and printed out speech bubbles. My daughters had fun writing on the bubbles. We attached the speech bubble to clear cord and taped it to the back of the painting. I know these aren’t exactly the kind of portraits you see at Hogwarts but as you will find out in my parties you need to have a little bit of imagination and pretending skills. 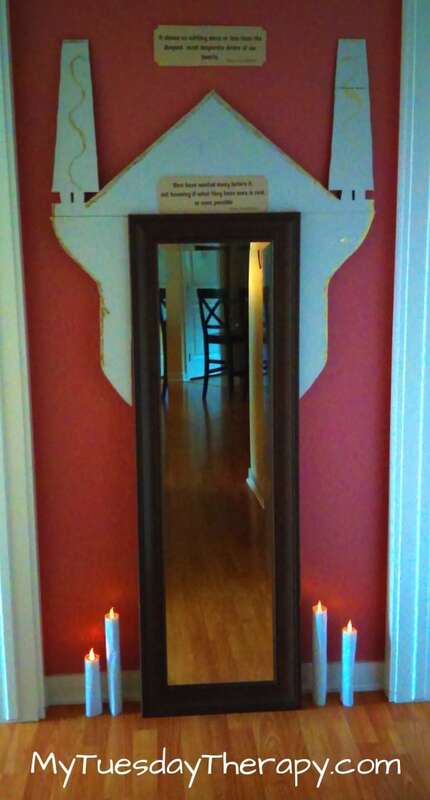 Simple cardboard frame transformed this mirror into the Mirror of Erised. Instead of painting the whole frame gold we used glitter glue to outline it. 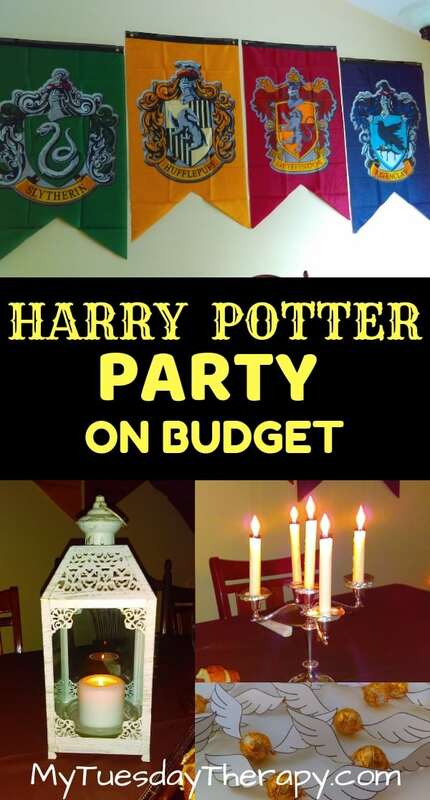 It really does not need to be complicated to add some fun to your Harry Potter party. 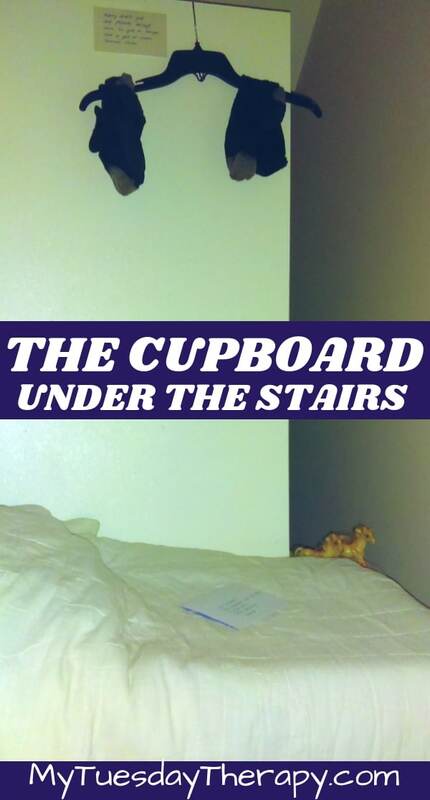 I couldn’t help but make “a cupboard under the stairs”. 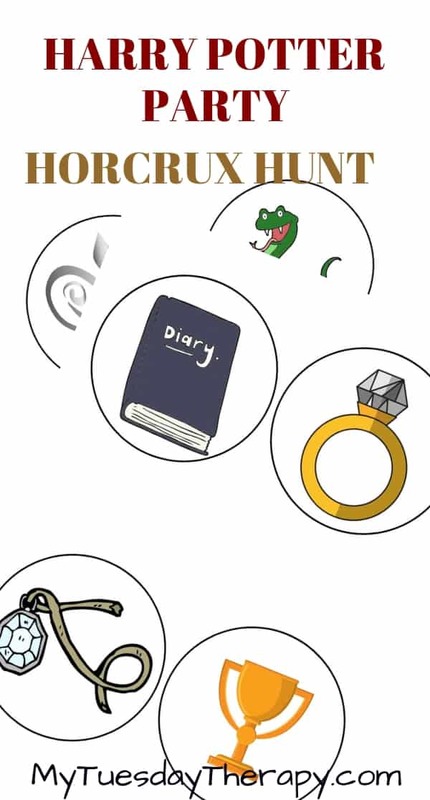 It was a glimpse in Harry’s life at the Dursleys. Harry Potter did not receive gifts from the Dursleys except a hanger and a pair of uncle Vernon’s socks. An invitation from Hogwarts is laying on the bed. Got to have an owlery at Harry Potter party. My girls have lots of Big Eye Beanie owls so we placed a few of those in the Owlery. 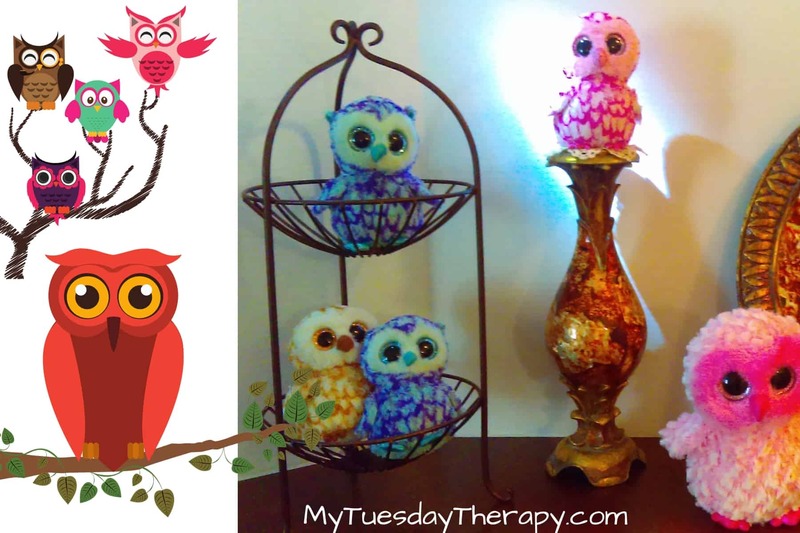 Branches, baskets, and candle sticks are fun places for the owls to sit on. If you don’t have Owl Beanies nor wish to spend money on these owls you could print out owl images and create your owlery that way. 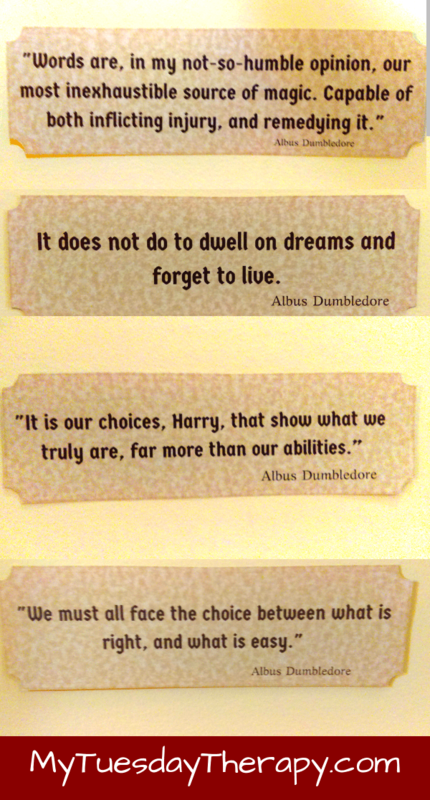 Print out quotes from the unforgettable Harry Potter characters. Here are a few we put on our walls. Since two of our daughters belong to Gryffindor and one to Hufflepuff (I’m a proud member of Hufflepuff too) we designated specific areas for those two common rooms. 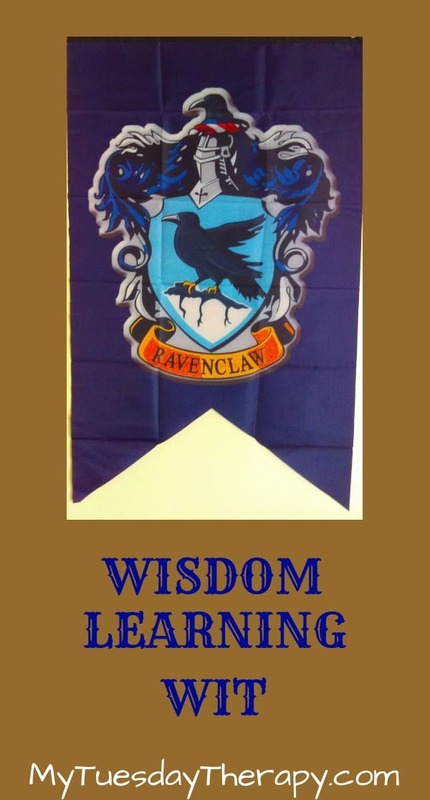 No worries, I have lots of ideas for the Ravenclaw and Slytherin Common Rooms too. Red and gold. 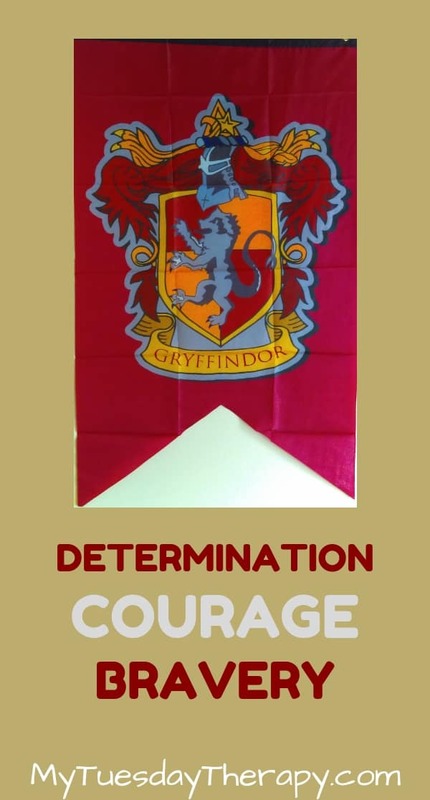 Those are the Gryffindor colors. With colors and few items you can create a common room where the Gryffindors love to hang out. 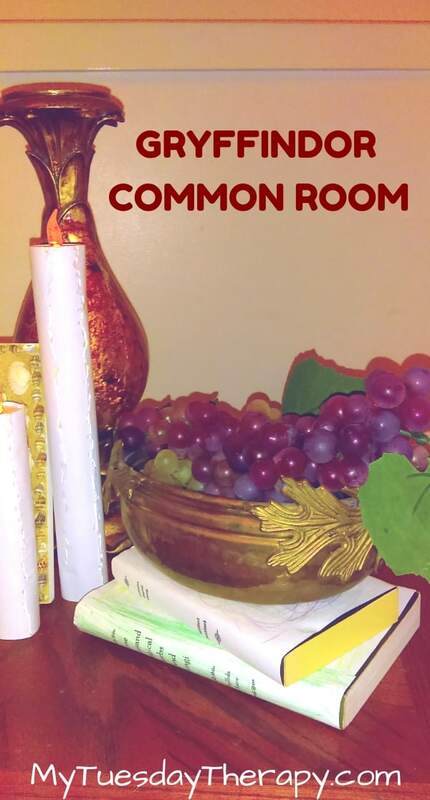 Simple props can create the feeling of being in Gryffindor Common Room. It will be great. I went through the house looking for items that we could use. 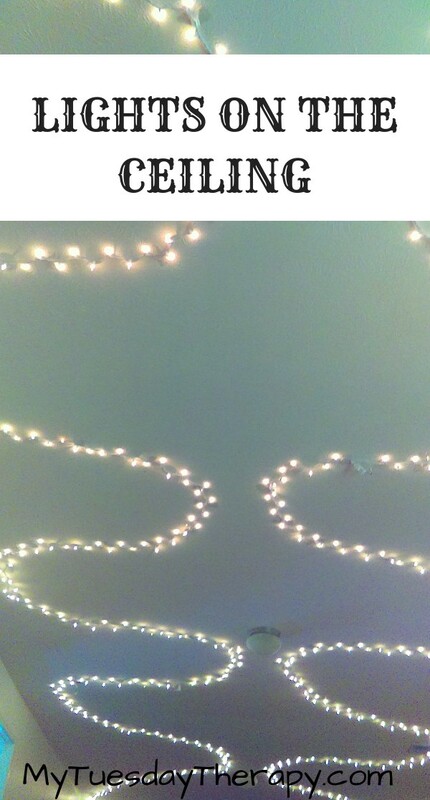 Our boring ceiling light was not enough so my daughters put Christmas lights on the ceiling for a lovely, cozy effect. We also found on youtube a fireplace video and that served as the fireplace with wood crackling sounds. It was pretty cool. And you don’t need to stop with these ideas. What else would go with Gryffindor? Yellow and black are the Hufflepuff colors. Their common room is cheerful with copper lamps, honey-colored wood, and plants. 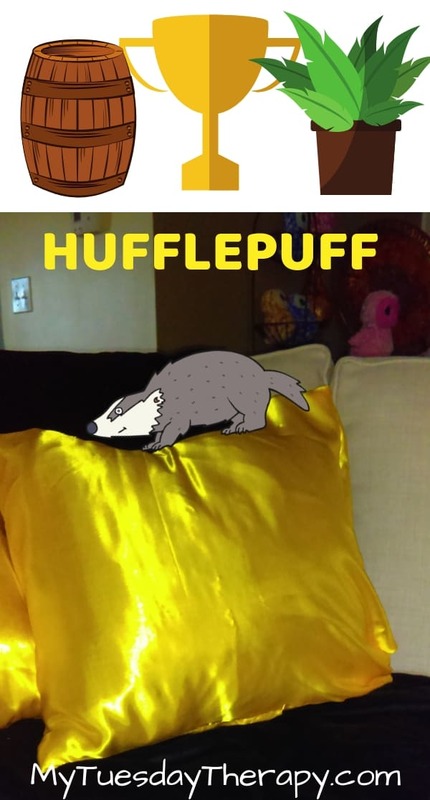 Just like for Gryffindor I looked around the house for items to put in the Hufflepuff Common Room. I purchased yellow fabric to make a couple of pillowcases and black fabric to cover the seat of an armchair. We also placed a black throw blanket on the couch. And let’s not forget about the fireplace. Make round doors out of cardboard to lead into dormitories and tape to the wall. It would be awesome if they could lead into actual rooms but fake doors as decorations are pretty fabulous too. 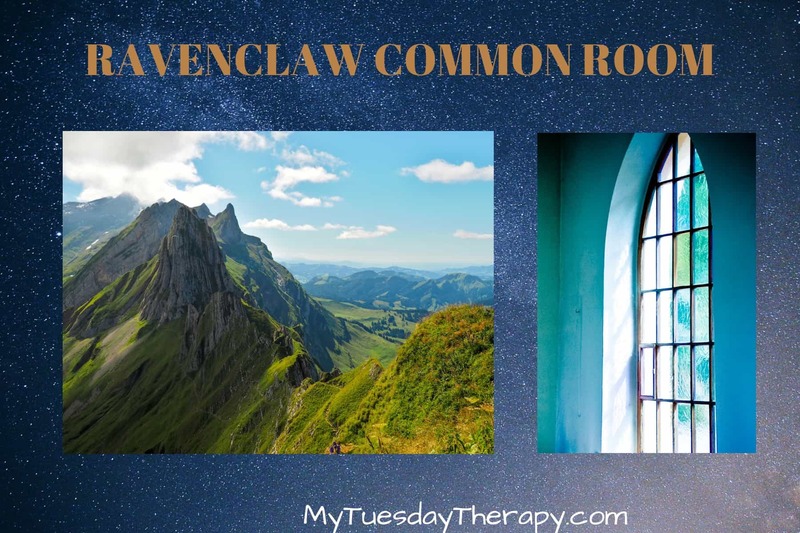 Ravenclaw common room is described to be airy, circular room with a beautiful mountain view and a domed ceiling painted with stars. Sounds really inviting! Ok… the colors… the mascot. Is it blue and bronze or blue and silver? Eagle or raven? Your party, your choice :). But if you’d like to have this amazing common room in your Harry Potter party look for items to go with your color theme. That is the easiest way to create the look on small budget. Since Ravenclaws are known for their love for learning and books, a big stack of books is a must. Several stacks of books or a whole bookcase of them. Ravenclaw common room has beautiful arched windows that you could create with cardboard. You could make a fake arched window in front of a mountain view. Use Christmas lights or glow in the dark stars to create the domed ceiling with painted stars. Drape blue sheers over curtain rods. And no common room is complete without a fireplace. Last but not least the Slytherin Common Room. It is a long room with low stone ceiling located in the dungeons and partially under a lake. Green and silver are the colors for this group of ambitious students. Their common room also has lots of black like black leather sofas. Just like with the other rooms look for items such as pillows, vases, blankets, bowls that go with your color scheme. 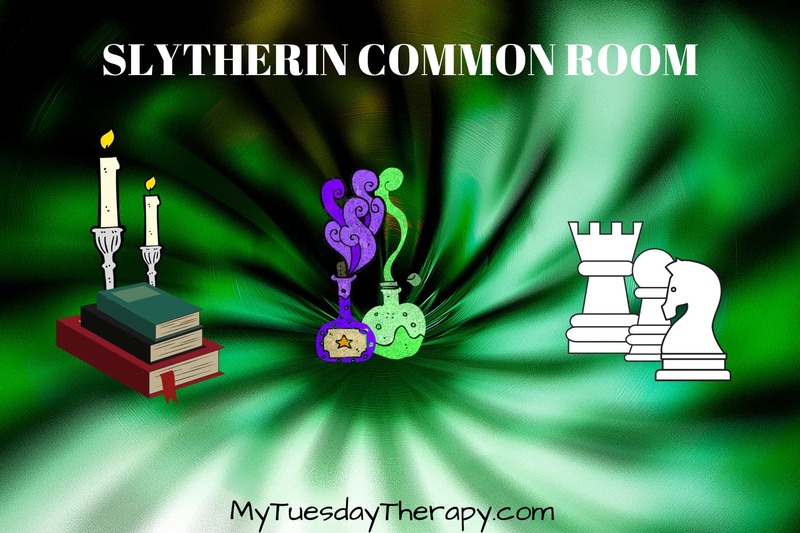 Use green light bulbs to give your Slytherin Common Room the green glow. And don’t forget the fireplace. A cardboard box with paper towel roll logs and red lights for fire works well. We made one a few years ago for Christmas. It actually was quite cute. 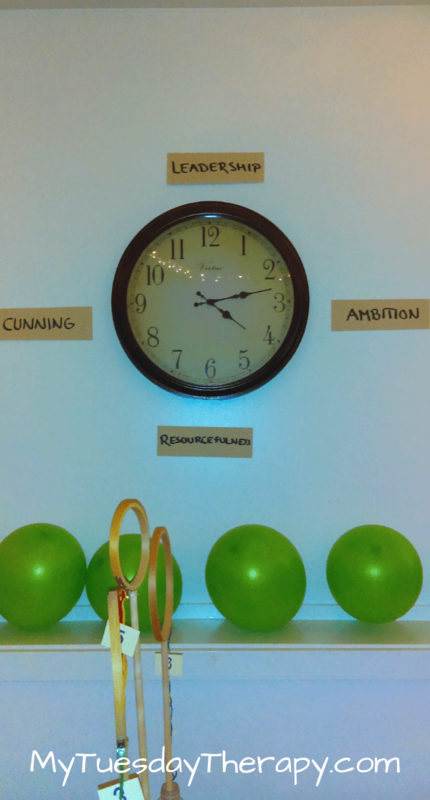 We did not have a Slytherin Common Room but just like for Ravenclaw we had few green balloons above our quidditch table. 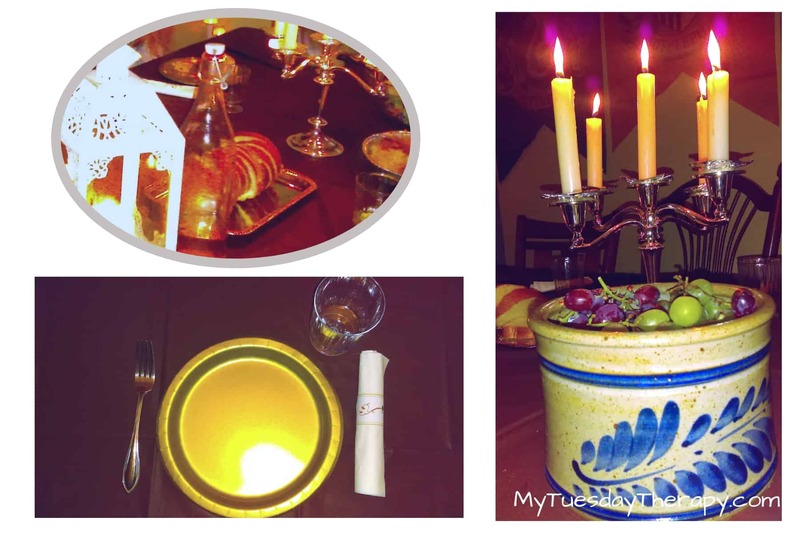 Floating candles and lots of food. 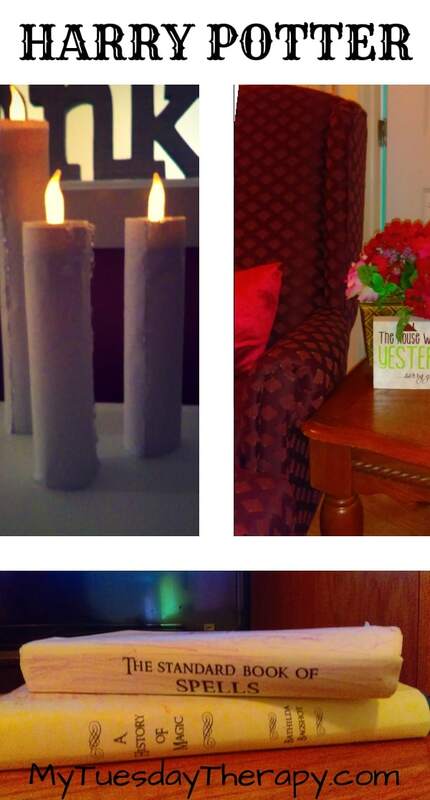 We made our candles with tea lights and copy paper. The plan was to use them as floating candles but that did not turn out the way we liked so we placed them all over the Great Hall and the whole Hogwarts. I actually liked it better that way. We bought this cheap set of 36 tea lights. I like the way the flame flickers on these. 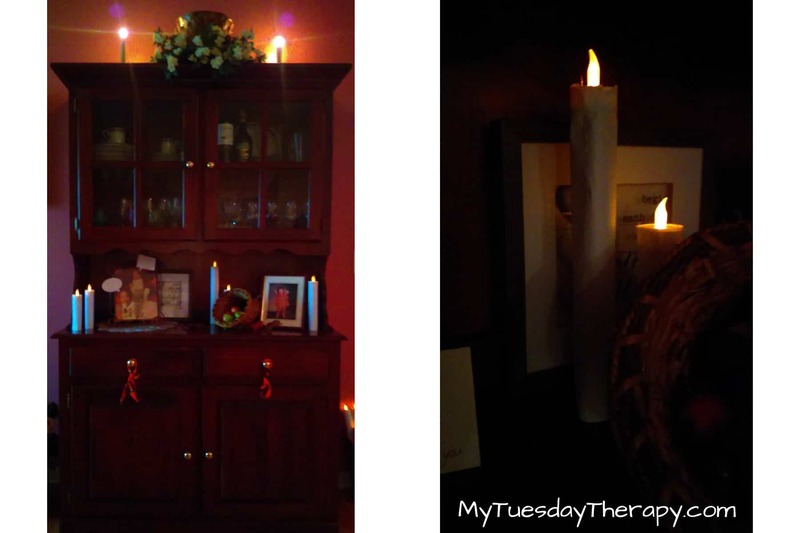 These tall candles are easy to make. All you need is paper and hot glue. Cut up the paper to desired length and width. Glue it to the candle. For additional lovely effect you can put some glue on the outside running down the seam and other places for melting wax. 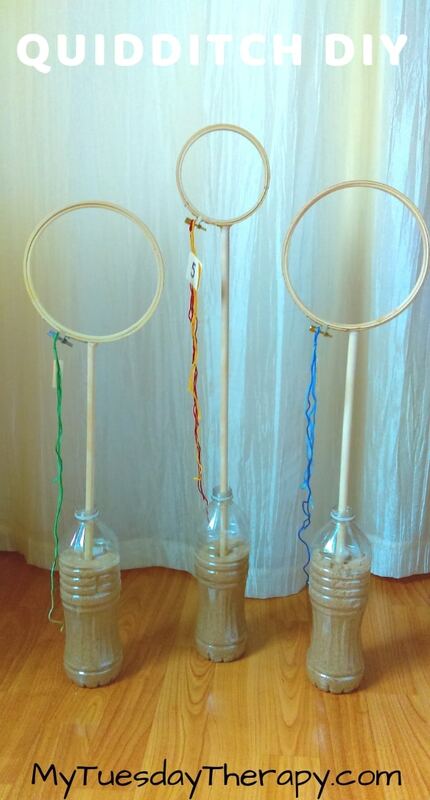 If you want to make floating candles for your Harry Potter party, you’ll need also clear cord. Glue the cord to the candle before gluing the paper. A chop stick comes handy in switching the candles on. I prefer real dishes for parties but for this one I chose to use paper plates. 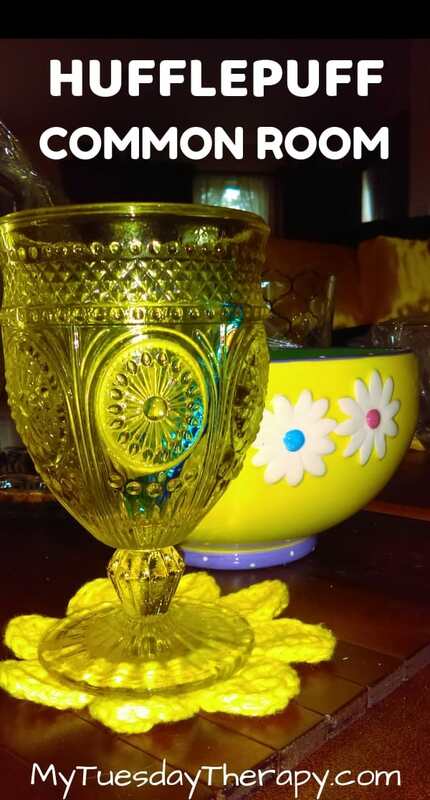 But using glass plates on gold charger plates would make a great statement. 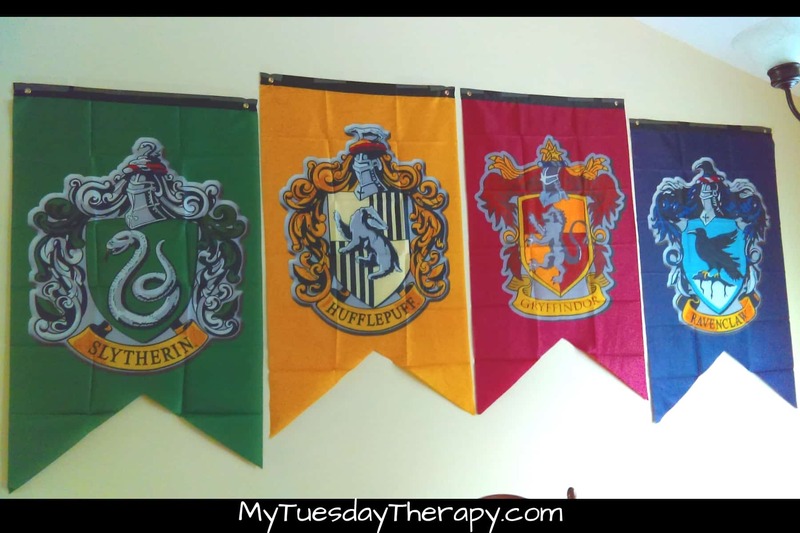 These Hogwarts banners are 30×50. They added a nice touch to our Great Hall. I didn’t want to make holes in the wall so we used packaging tape. They actually stayed up well. 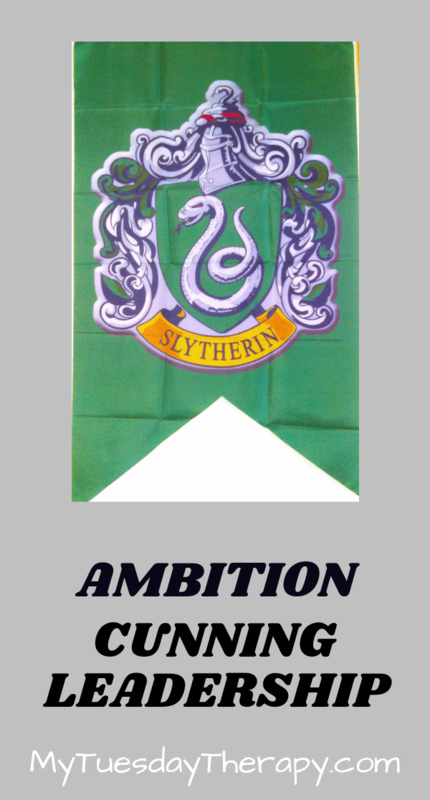 Only the Slytherin one slithered down a couple of times but thankfully not during the party. 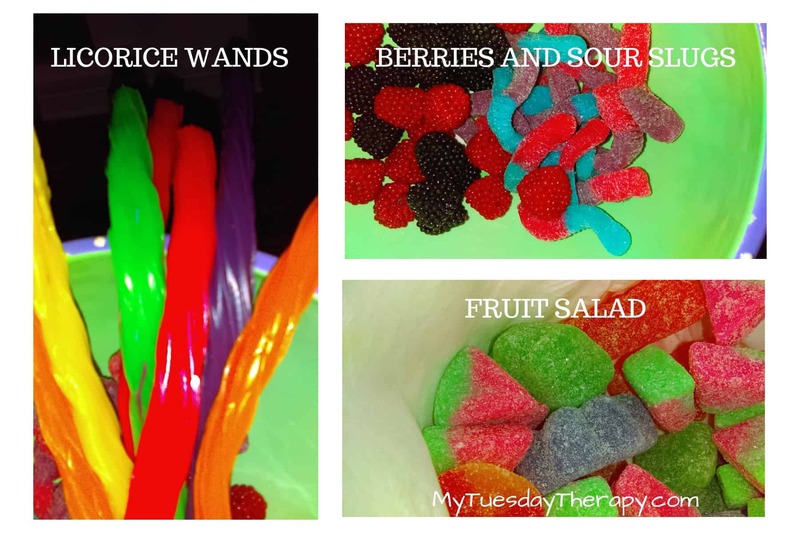 There are so many choices for Harry Potter party food. You don’t even need to get creative with this one just prepare regular food… that’s what they ate at Hogwarts feasts. I know some of you do like the creative food ideas. These 16 BRILLIANT HARRY POTTER FOOD IDEAS might be just what you are looking for. We served the desserts in the Hogwarts Common Rooms. Bowls filled with chips, popcorn and sweet treats were a hit. 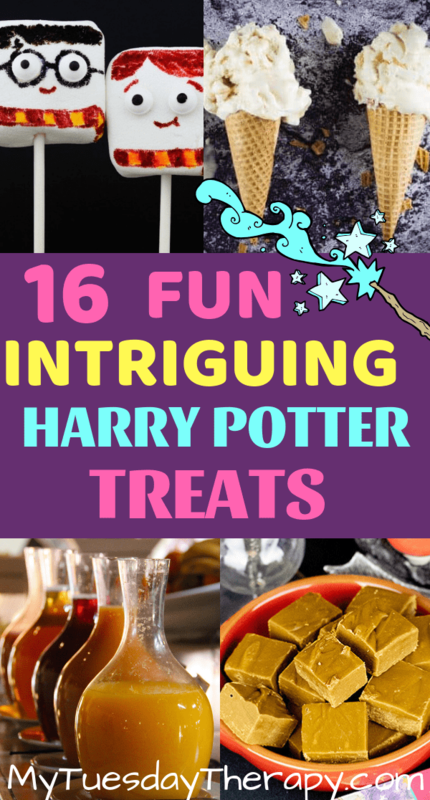 If you are looking for easy Harry Potter treats here you go. Place chocolate and condensed milk in a pot. Heat on low until the chocolate is melted. Let cool. 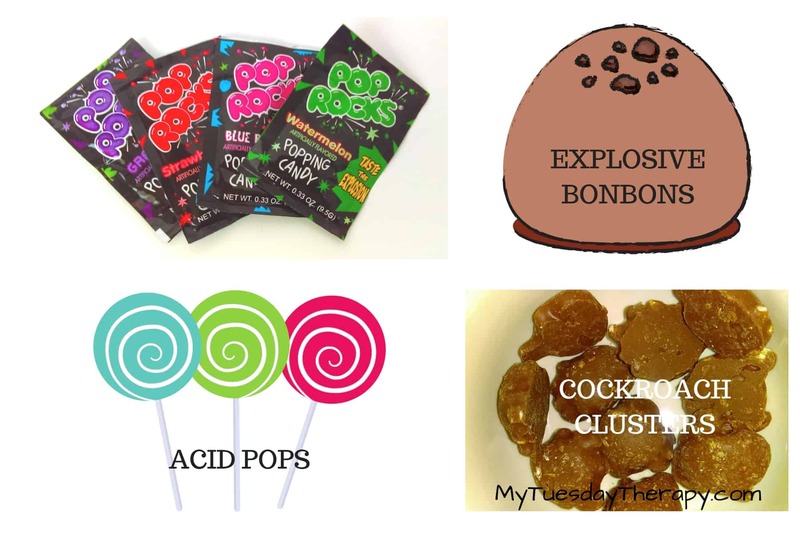 Shape into truffles and dip in pop rock. Store in the fridge. These chocolate truffles are amazing!! Our party guests were between ages 10 and 18 so we had various games for them to do in their age groups and together. A golden Snitch was hidden in the Hogwarts for each guest. We wrote their names on the wings and they had to find the Snitch with their own name. 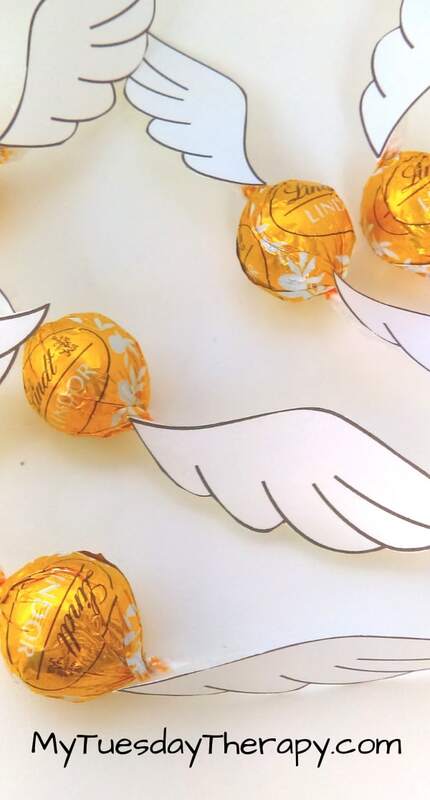 All you need is Lindt chocolate, wings, and hot glue. First we tried taping the wings but as you can see in the picture they started to come off. A little drop of hot glue on the wing kept them in place. Cut the dowels to the length that works for your table. Glue on the hoop. Stick the dowels into plastic bottles filled with sand. The girls came up with their point system and game rules. They had a great time playing together. 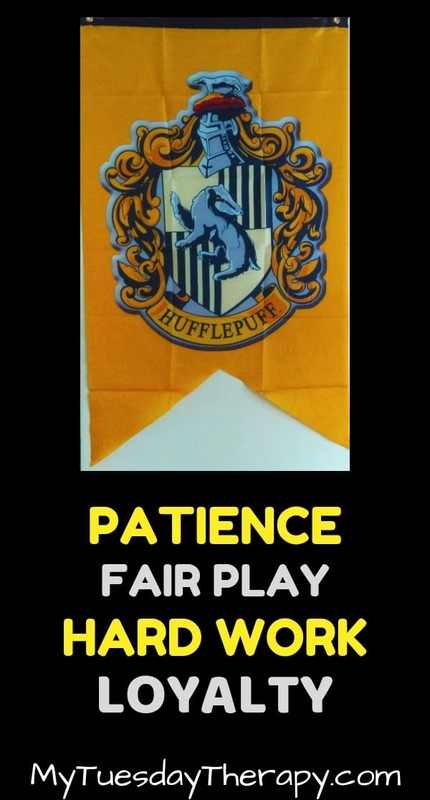 The winning House (Hufflepuffs!!) received a bowl full of chocolate. I have never played Mafia so I won’t even try to explain it to you. My girls like that game and you can find detailed instructions here (Ice Breaker Ideas). You can play it Hogwarts style and change the character names to be something from Harry Potter, for example Mafia members could be Death Eaters. A little quiz to test the guests’ knowledge of the Harry Potter story. We had a list of quotes and the guests had to figure out who said it. They got an extra point for knowing the book. Hide the Horcruxes in the party area and send the kids looking for them. Some say Harry was a Horcrux some say he wasn’t. I go by the explanation that he was not a Horcrux since he did not become an evil object. I made clues for the Horcrux Hunt. Since our guests were older the clues were questions about the location of the Horcrux and how it was destroyed. Then I hid the Horcruxes in those locations. Simple signs were used for designating the areas such as Forest of Dean and Ministry of Magic. Since it is a Harry Potter party the words for these games have something to do with Harry Potter. Whether you make teams or take turns individually this game can be hilarious. In simple version a player picks a paper slip and draws on the white board what’s on the slip. The others guess. The first one to get it right does the next drawing. You could also play it as teams. Set a time limit for drawing and guessing. If the team does not get it right during the set time then the other team gets to guess. Telestrations is fun with a large group. It is amazing what a simple word can turn into. Each player picks a slip of paper and writes the word or sentence on the first page and then draws it to the next page. Flip one page and pass it to the next player. The next player peeks at the drawing on the previous page and writes what she saw on the next page. The next player peeks at the word or explanation on the previous page and draws it on the next page. Keep alternating between drawing and guessing the drawing. Once the original player receives the notebook it is time to go through all the notebooks and see the drawings and guesses. Instead of coming up with our own Would You Rather Questions we used the fun questions from Kitchen Counter Chronicles. These questions are suitable for anyone. This is an awesome game for large group. You’ll need a couch and chairs (to have enough seats for everyone) plus one extra chair. If you don’t have enough chairs for everyone, no problem. Mark the spots on the floor with washi tape. Let’s say it is Hufflepuffs against Gryffindor. Have everyone sit in a circle in alternating order H – G – H – G. Each team should have two players on the couch. One empty chair. Write the names on a whiteboard so everyone knows “who” is in the game. Mix the paper slips in the bag and hand them out to each participant. They must keep the name a secret. Whoever is sitting on the right side of the empty seat gets to start. Let’s say her name is Becky. Becky calls out a name, like Ron. Then whoever is “Ron” gets ups and sits in the empty seat next to Becky. Then to make it little more complicated and fun Becky and Ron trade paper slips. Becky is now Ron and Ron is whoever was on Becky’s paper. Now, there is an empty seat where Ron used to sit. So the person on the right side of that empty seat calls out a name. And the player who has that name moves to the empty chair, and those two switch names. And so on. Keep calling names, switching papers. The players try to figure out who are the opposite team members on the couch. They try to remove them from the couch and place their own teammates there. The team who is able to get four of teammates on the couch wins. As a general rule: the team members aren’t allowed to help the team member whose turn it is to call out a name. 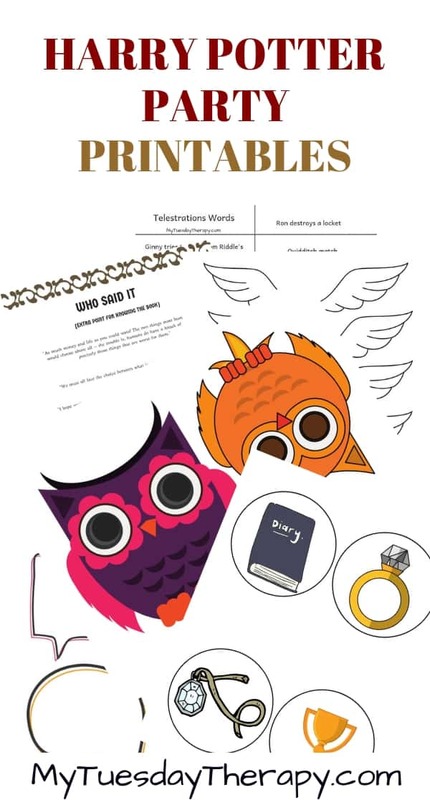 This Owl Bookmark Origami from Red Ted Art is super cute and easy to make. Our guests had fun making them. I’m sure yours will too. 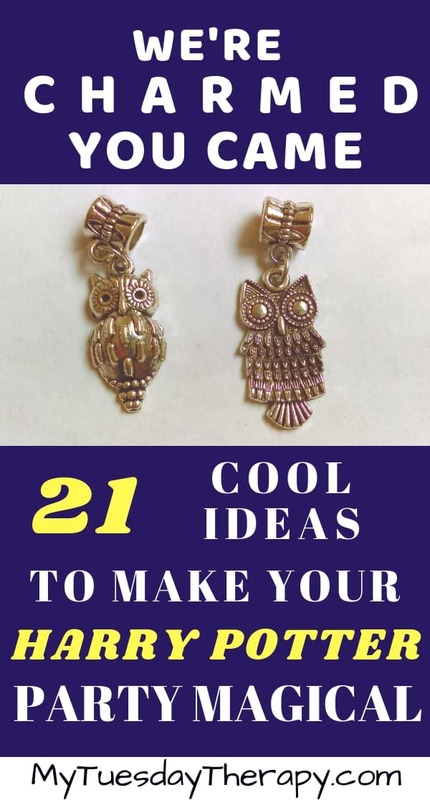 Give your guests lots of cool memories and an awesome wand and adorable owl charms. Got to have a wand at Harry Potter party! 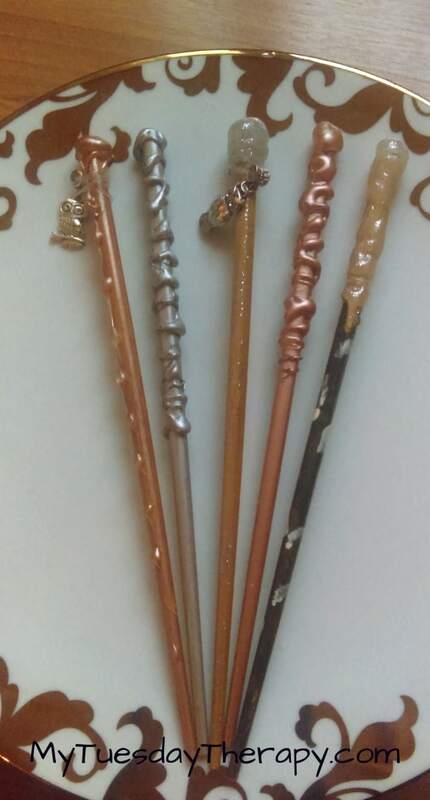 My daughters made these cool wands with chopsticks, hot glue, and paint. We had them in a bucket in the foyer for everyone to grab when they arrived to the party. 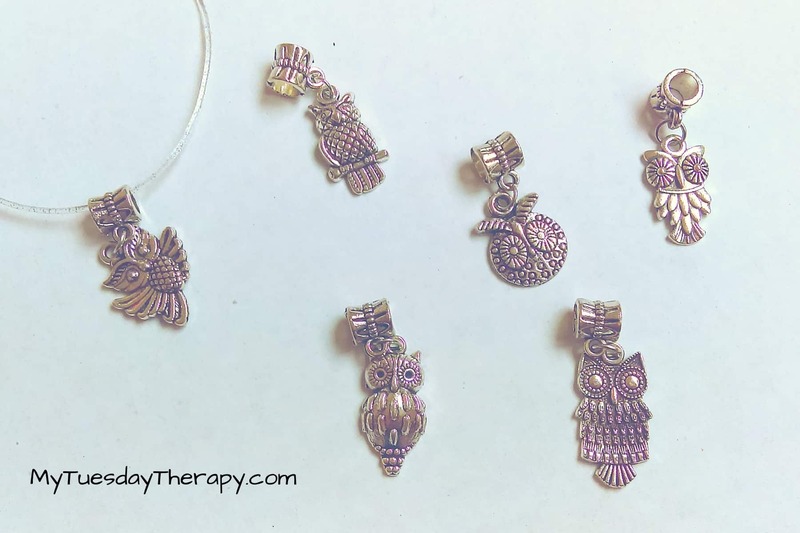 Give everyone a sweet owl charm to remind them of the fun time they had at your Harry Potter party. I bought an inexpensive set of 30 owls. We attached them to stretchy sparkly clear cord.